Roger Federer overcame a very stiff resistance from Philipp Kohlschreiber in the 1st Round of Gerry Weber Open, Halle 2015. Federer a 7 time champion at Halle was just two points from defeat but managed to beat the German 7-6(8), 3-6, 7-6 (5) in 2 hours & 11 minutes to reach the Round of 16 at Halle. This is the 1st year where in we have a 3 week gap between Roland Garros and Wimbledon, also the tournaments at Halle and Queen's have been upgraded to ATP 500 from ATP 250 level. Quick clarification about the ATP points, the winner of the last year namely Roger Federer (Gerry Weber open) & Grigor Dimitrov (Aegon Championships, Queen's) are only defending 250 points. Federer saved two set points in the first set tie-breaker but managed to win the tie-breaker 10-8. The German won the 2nd set 6-3, this was just the 2nd set that he managed to win vs the Swiss maestro in their 9th meeting. Federer had two match points in the 10th game at 15/40 on the German's serve but the German managed to save those & immediately had a break-point on Federer's service in the very next game, but Federer managed to save that and it was tie-breaker. Again the German had a chance to close out the tie-breaker as he lead 5-4 but Federer won the last 3 points to win his 47th match at Halle. 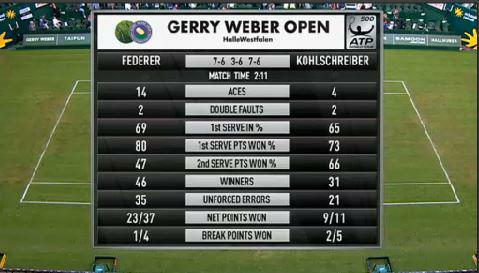 Federer won 108 points while Philipp Kohlschreiber won 109 points in the match. This was just the 6th time when Roger Federer won a match in his career after winning fewer points than his opponents. While Roger Federer till date has lost 26 matches after winning more points than his opponents. Federer will play the winner of Sergiy Stakhovsky vs Ernests Gulbis on Wednesday in the Round of 16. Scroll down for more pics, video highlights, hot shot, interview quotes & more insights from the match. There were several instances where the players lost their footing and slipped over on the grass in this match. One in particular showed the quick reactions of Roger, where he actually made a shot as he rebounded from first hitting the ground! Must admit my main concern there was that he did not twist an ankle or strain a ligament or something, thankfully he appeared to be OK. It wasn't exactly a stunning performance from Roger today, not helped by an upset over a late line call, but at least he made it by the skin of his teeth. Comms mentioned that he has not practiced on the centre court since he's been in Halle this year, so granted it would have taken a while to settle in to conditions on there. Let's hope that this match served as the warm up he needed to progress with slightly less tension in the next round.